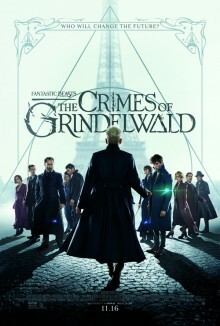 “Dangerous Liaisons,” “Gandhi,” the “Harry Potter” films), four-time Oscar-winning costume designer Colleen Atwood (“Chicago,” “Memoirs of a Geisha,” “Alice in Wonderland,” “Fantastic Beasts and Where to Find Them”), and Yates’ longtime editor Mark Day (the last four “Harry Potter” films). The music is by eight-time Oscar nominee James Newton Howard (“Defiance,” “Michael Clayton,” “The Hunger Games” films). Join LatinoScoop at an exclusive advance screening of FANTASTIC BEASTS: THE CRIMES OF GRINDELWALD in select locations below. Click on the city name below for your city and enter the code. If you download a screening pass and aren’t able to use it, please share it with someone who can attend. There is a limited number of passes available for each location. Screening passes are available on a first-come, first-serve basis. Additional passes will not be added once they are all redeemed. Anyone downloading a screening pass is advised to arrive early to secure seating. The theater is intentionally overbooked by the studio to ensure a full house. Plan accordingly to arrive at the theater with enough time.